Got the idea of ​​horseradish mayonnaise from a promotional film on TV about Sushi where the 'chef' mix mayonnaise with wasabi. I realized that the combination has to be perfect for regular fish too. I do not eat Sushi at all because I totally hate raw fish, but cooked fish I love. This was actually just enough for me, if you need more then double the recipe. Do not be afraid that the horseradish mayonnaise is strong, along with fish and vegetables it wont be that strong if you don't not like it. Horseradish may have differnt strenght so dare to taste how much you like. 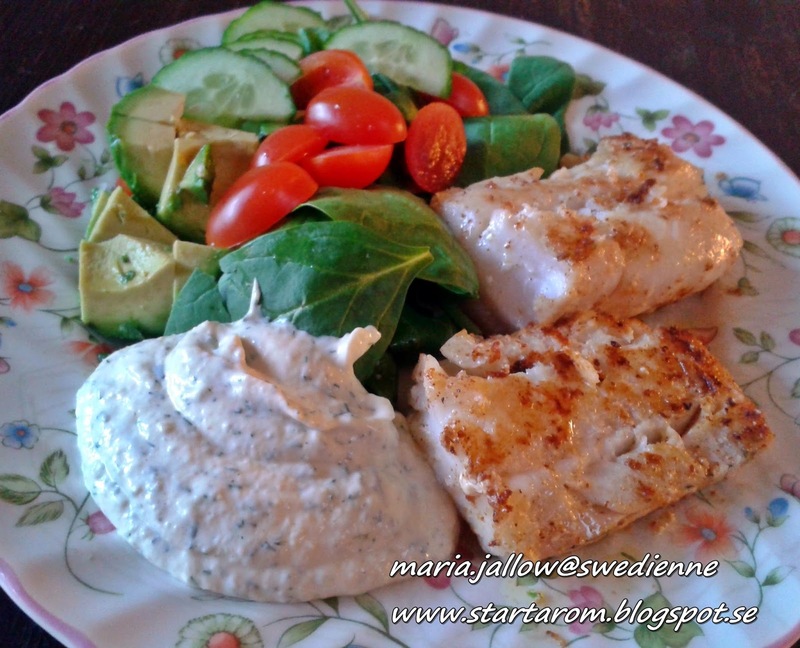 Added to this was served two pieces of fine back filet cod which I fried in plenty of butter, white pepper and salt. I poured the butter over the fish while I fried it. Was served with a salad of fresh organic spinach, half a avakado, organic small plum tomatoes and cucumber. Really good and very easy!